As in previous years, the Public Speaking Competition, now with a new title here in Hungary – The BBC Entertainment and ESU Public Speaking awards – is open to students aged 16-20 in full time education. 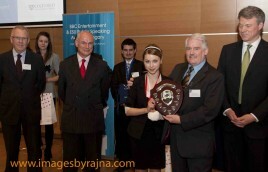 The winner and runner up will go on to compete in the English Speaking Union’s International Public Speaking Awards in London from 23-28 May 2011 where the title will be ‘WORDS ARE NOT ENOUGH’. Congratulations to all of the other semi-final contestants not qualifying for final 8. The standard was very high and any of the competitors would have been capable of representing Hungary. Thank you to all of the local round organisers and thank you all too for the photos which have been sent. They will appear here on the website shortly. We would also appreciate photos of any local rounds to publish on the website. To assist both teachers and students training sessions with expert trainers are being organised. There are separate sessions for both pupils (intermediate level and above as these will be conducted in English) and teachers of English. Click below for further information on these trainings. Further training will continue throughout the year so keep your eyes on this website for further details. – Are comedians becoming too offensive or are we taking ourselves too seriously? – Is life becoming too dangerous? – Are we becoming too desensitized to crime and violence? – Does TV distil or improve our general knowledge? Participants took part in a series of local heats in the lead-up to the national semi-finals and final on Saturday 16 April 2011 at Magyar Telekom Headquarters, H-1013 Budapest, Krisztina krt. 55. The organisers would like to thank Telekom and BBC Entertainment for their sponsorship and support. The international final showcases the very highest standard of public speaking by young people from around the globe and gives students an opportunity to understand each other’s different backgrounds and cultures. Last Year’s Hungarian winner, Eszter Gelsi said “my biggest dream seemed to become reality”.